According to David Vinjamuri (The Strongest Brand In Publishing Is ...) Lee Child's fans are the most loyal of any bestseller, even Stephen King and John Grisham. That is, Lee Child has the highest percentage of readers/fans who will buy his next book, sight unseen. "Child carries a higher percentage of his readers with him to each successive book than any other bestselling author. While just 41% of John Grisham’s fans owned or planned to buy his newest novel Sycamore Row, 70% of Child’s fans wanted a copy of the last Jack Reacher tale “A Wanted Man”." The question: What's Lee Child's secret? What did he do to generate such reader loyalty? David Vinjamuri caught up with Child in Manhattan and asked him. "A series is better than a sequence of [unrelated] books in terms of building brand loyalty. There are two components of loyalty: one is the author and the second is the subject. If you like the author but you’re uncertain of the content of the next book, that’s an obstacle. It runs counter to the literary view of writing that values originality and growth. Jack Reacher is the same person in every book. He’s unemotional and focused on detail. There are lots of things that he always does that characterize who he is." By the way, an interesting article on Lee Child is: Lee Child debunks the biggest writing myths over at writersdigest.com. "Authenticity is not the same thing as accuracy. I live in New York. If you know New York then some of the actual reality of [life in] New York might not seem believable to the reader who doesn’t live here." That it happened in real life is no guarantee your readers will find something believable. To create a believable story it helps to begin with believable characters; a story is only as good as its characters just as a cake is only as good as its ingredients. - What would make this character do something they don't want to do? - What would make this character do something they vowed they would never do (again)? - What would this character die for? - What would this character kill for? Read more: On The Art Of Creating Believable Characters: No Mr. Nice Guy. Also, see Tags, Traits And Tells. "I ignored all the other series. If you start with a laundry list of things then the book won't be organic. Reacher is not a white knight. He lies and cheats and steals but because he’s doing it with integrity, people recognize him as a real human being." a. Make the protagonist unique. As much as I love Indiana Jones, or Hercule Poirot, I wouldn't want my protagonist to be exactly like them. What would be the fun in that? Ignore what everyone else is doing and do your own thing, go your own way, but make sure your hero/protagonist has integrity. b. Make the protagonist relatable. Give your protagonist integrity, where that cashes out to having a clearly defined personal code and sticking to it, even when that's not comfortable. Much has been said--and, I'm sure, will be said--about the relative importance, or unimportance, of likability as a character trait. Some swear by it and other's scoff at it. We can all think of characters who we loved that were likeable (Harry Dresden, for example), but many aren't: Dexter, Walter White, Frank Underwood. What attracts us to unlikable characters? In a word: relatability. It isn't important whether readers/viewers/listeners like your protagonist, what matters is whether they have some sort of personal code that they stick to. c. Have the protagonist seek justice. A protagonist can be one bad dude or dudette as long as they are trying to do something just, something noble. For example, a hitman struggling to save a child from being murdered by another hitman. d. Measure the protagonist against the other characters. Your character will be measured against the other characters, especially the antagonist and his/her minions. I've just finished watching the second season of House of Cards (don't worry, no spoilers!) and--wow--Frank Underwood is not a likeable character. But Frank Underwood (his initials: FU) lives in a dystopia where every character is a shark and no one is likeable . When the viewer measures him against the other characters, especially the antagonist and his/her minions, we find that he's not so bad. He's a shark, but he's a shark swimming with sharks. That's the background against which we evaluate his actions. e. Have the protagonist be the best. There's something to be said for having a protagonist who not only does something well, but does something better than anyone else. Of course then the storyteller has the problem of figuring out how to plausibly put the character in danger, a problem which can be overcome by (among other things) pairing them with someone weaker whom they must take care of. Part of the reason I care about Frank Underwood is that he is the biggest and baddest and best shark of them all. He will grit his teeth and make painful personal sacrifices where others won't. Further, he is self-aware. He knows his strengths and his weaknesses and this allows him to see other people's strengths and weaknesses, and then exploit them. No, he's not a nice character, but one can still find qualities to admire. He has--if I might put it this way--a twisted semblance of integrity. He values ruthless pragmatism above all else. If you haven't already read David Vinjamuri's article The Strongest Brand In Publishing Is ... (forbes.com) I would encourage you to. And thanks to Michael +Kelberer for sharing the link through his (excellent!) Google+ account. Until next time, good writing! 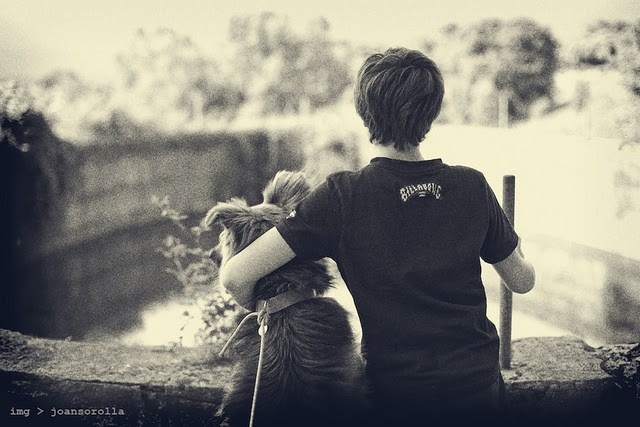 Photo credit: "Friends for life" by Joan Sorolla under Creative Commons Attribution 2.0. I think a main difference between having a character do something "they wouldn't do," and having them do something just unpredictable/being complex is when the author's motivation supersedes the character's. You can convincingly have them do something out of character as long as it's not obvious why the author would benefit from breaking her own rules. Hi Daveler, thanks for your comment. "What would make this character do something they don't want to do?" Characters, like people, are routinely forced to do things they don't particularly want to do because they're pursuing a goal. And, as you've pointed out so well, much of it does depend on motivation. Karen, Great stuff. I was told that once I began writing, I'd never read the same way again, but I must admit that--although I've read all of the Reacher books--some of this never really came through to me until now. Thanks for sharing. Thanks Richard! I've heard the same thing, and I've found it's true for certain kinds of stories. Certain things I just don't enjoy as much as I used to. But I've been fortunate; my favorites, those books I've cherished all my life, those have (on the whole) stayed as enjoyable and as fresh as when I first read them. Thank you for sharing this Karen. It is certainly some good advice and as I've progressed through my first book I took the time to read dozens of books looking for the things that drew me to the sequels. I think you really hit a lot of those on the head! Thanks for sharing this. It definitely gives me something to think about.